It’s no secret that the beauty industry is huge nowadays. Bloggers and influencers in the field are awarded celebrity status, while relevant brands come out with innovative products and collections almost every month. One of the hugest trends seems to be that of organic cosmetics, and mineral makeup is winning the game in this category. In recent years, clean and natural formulas have become increasingly popular. The best mineral makeup available on the market has plenty of advantages over traditional formulas. With summer rolling around, it’s important to keep in mind that one of them is more staying power through the heat. Here is everything you need to know about the topic. As its name indicates, mineral makeup is made using various minerals. These include mica, zinc, and titanium oxide. After these are milled into a super-fine powder, pigment is added to create various types of products. The most commonly encountered are powder foundation, blush, bronzer, and eyeshadow. The main advantage of using this type of makeup is that it leaves out plenty of noxious substances that more traditional cream or liquid formulas rely on. Mineral products are free from preservatives, oils, waxes, bulking agents, and synthetic fragrances. This makes it an overall cleaner alternative that is especially friendly towards sensitive skin. Furthermore, due to its ground format, mineral makeup is recommended for oilier complexions as well. Due to it being so finely milled and delicate, it is also non-comedogenic, which means that it doesn’t clog your pores. Thus, you can keep excess oils at bay and avoid breakouts at the same time, which is a win-win. Thanks to advanced production technology, mineral makeup can be found in liquid form as well. This is useful if you are in dire need of a natural primer or the perfect lipstick color to top off your look with. Of course, other products are available with this formula as well, which means that the dry-skinned beauty lovers out there have reason to rejoice. The absorbent properties of mineral powders come in handy especially during the warmer months of the year. The complexion is as prone to sweating as any other part of the body, and this stimulates the secretion of excessive sebum as well. With a hot summer coming up, it’s important to stock up on products that keep you matte and flawless. According to bareMinerals artist Renee Lynn Smith, applying a base using solely mineral products is recommended for summertime because the products are light and airy, yet provide the skin with enough coverage to obtain a flawless complexion. She recommends that primer, foundation, blush, and bronzer fall into this category. After preparing the face, put on the powder foundation using a big, dense brush with a short handle, such as a kabuki. Remember to swirl, tap and buff in the product so that the application is a smooth and even one. This also prevents it from clinging to any dry patches you might have in your problem areas. This product doubles as a concealer as well because its weightless texture allows for layering. To conceal any blemishes, discoloration and undereye bags, use a flat brush and pat the powder in the desired areas. Finish off the base with mineral blush and bronzer to define and brighten the face with a sun-kissed glow. If your eyelids tend to get particularly oily in the heat, mineral eyeshadow is also something to consider. You don’t want the product to crease or run down your face during the day, especially when you have a busy one ahead of you. Although many brands manufacture beautifully metallic or glittery pigments in this format, mattes can be found as well. A bright champagne color is perfect for all over the lid, with a mid-toned brown in the crease. For a bit of subtle definition, try lining your upper and lower lashing with a darker espresso color, as black tends to be too harsh. Of course, if the occasion calls for more dramatic makeup, don’t be afraid to go all out. Mineral makeup has you covered. 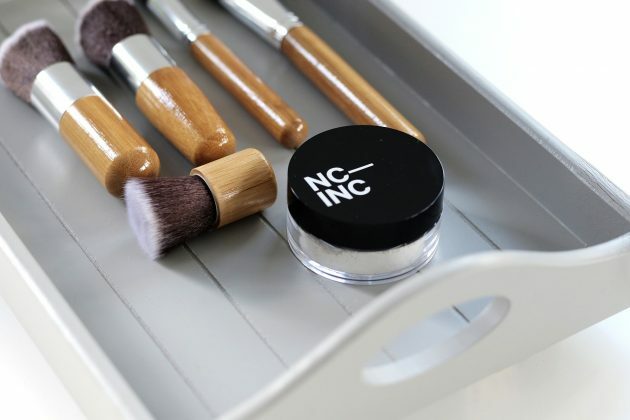 The main ingredients of mineral makeup are right there in its name. This makes it an organic alternative that doesn’t clog pores and leaves a flawless appearance behind. Several complexion types can thus benefit from its properties, especially during the warmer months of the year when sweat leaves the face looking oilier than ever. If you want to guard yourself against unpleasant situations, enriching your collection with products for a fully mineral face base is in order. In this way, you needn’t worry about things slipping and sliding everywhere once summer rolls around.